Today I worked out in the back yard. All. Day. Long. I’m beat, but got a lot done, and it was a nice day. A bonus…it was nice seeing all the birds coming to my feeders, including a still very active hummingbird feeder. This is my yearly, gloomy post, focusing on the fact that my hummingbirds are about to leave me for, oh…8 months. The males already are slipping away, as most of the birds I now get are females and young. I have about 4 more weeks before they all disappear. But this year shall be different! I refuse to go 8 months without seeing a hummingbird! We are taking a family vacation this winter to Arizona, and while it’s not exactly prime hummingbird season in either variety or number, there are still plenty of hummingbirds around at that time of year. Today’s POTD is a Costa’s Hummingbird who obviously had just fed, from Madera Canyon in Arizona in November 2011. I just can’t do it today. I can’t watch the news. I can’t read the newspaper. I can’t turn on the TV. Not today. Not on a day where we’re losing one of the most dignified, graceful, moral families that have ever graced the White House. Not on a day where many are celebrating a victory by hatred, by racism, by ugliness. For today, a needed shot of some of the “beautiful” things in the world. Here are some of my favorite photos, and the story behind them. Black Oystercatcher – Cannon Beach, Oregon – June 2009 — We first visited Cannon Beach in Oregon as a family about 11 years ago. We’ve been back several times since, as it’s become one of our favorite vacation spots. From a birding perspective, it’s heaven on earth for me. “Haystack Rock” is just off the beach, a massive rock spire that is home to hundreds of nesting Murre’s, Puffins, Gulls, Cormorants, and other species. It’s a fascinating place for my son, and the vibrant tidal pools have always been a favorite of his. 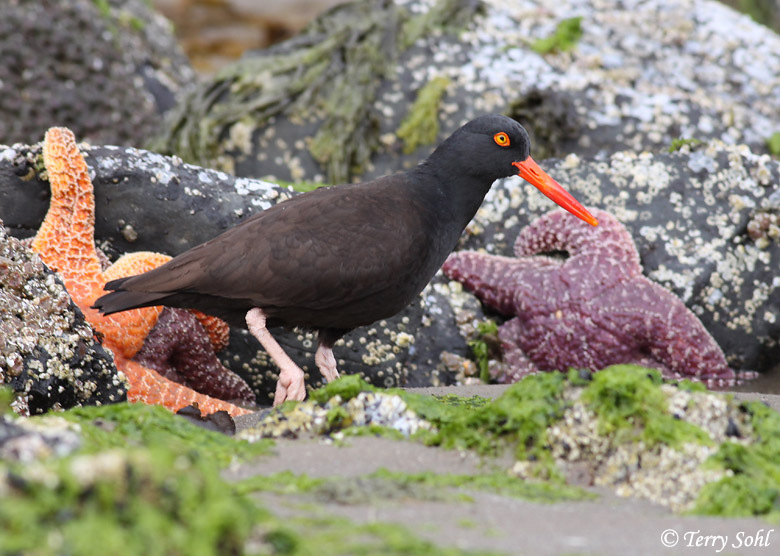 Cannon Beach is the first place I saw a Black Oystercatcher, and at dawn one morning I was able to capture a photo of one foraging amongst the rocks at low tide. Being able to capture such a unique bird against a backdrop of colorful starfish was a real treat. Western Bluebird – Zion National Park – May 2008 — We LOVE our family vacations, particularly visits to national parks. This was in 2008, our first visit to Utah and Zion National Park. 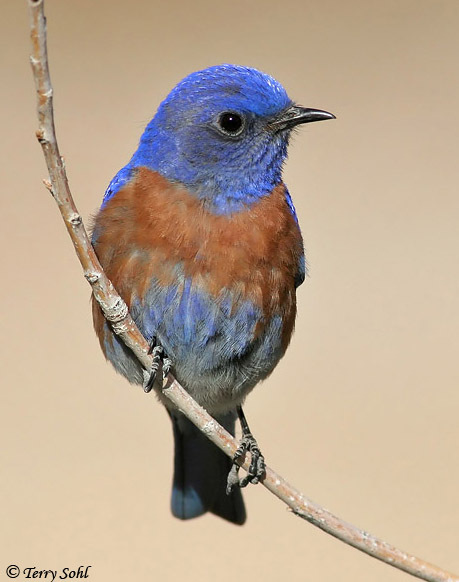 I’d seen Western Bluebirds before, but didn’t have any photos. This gorgeous male decided to make things easy for me. We were sitting on the back patio of our B&B one night when he flew around the corner and landed in a tree about 15 feet away. A rarity in bird photography…getting an easy opportunity. This is one of my favorite photos though, with the warm colors of the canyon in the background, the curve of the branch, and the beautiful clean view of the bird. Burrowing Owl – Near Brandon, South Dakota – August 2008 — It’s the location of this shot that makes it a special memory for me. I will often drive 3 to 4 hours to go birding in the central part of the state. In any season, prairie dog towns are good places to bird, as they attract a variety of birds. One of the reasons I like to visit prairie dog towns is because many of them also house Burrowing Owls. I’d seen them many times in the central part of the state, but always at least 200 miles from home. In August of 2008 I was returning home from a business trip, was driving on a road just northeast of my hometown of Brandon, and I saw something sitting on a fence post. 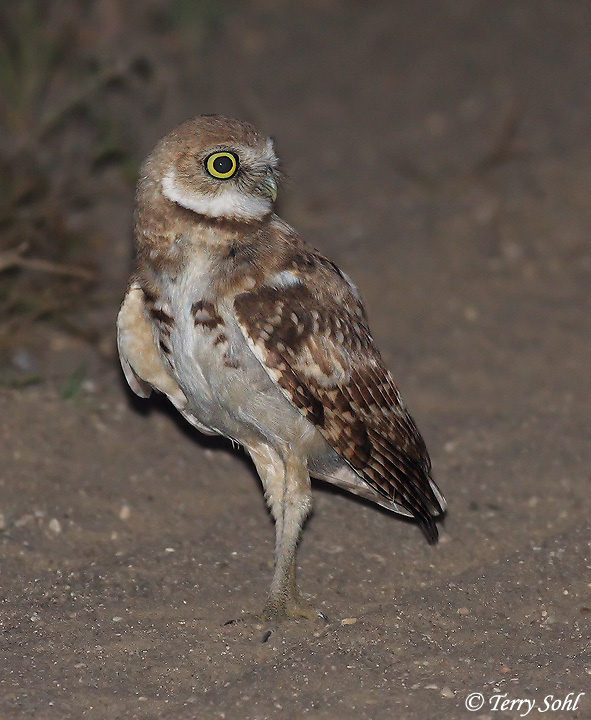 A double-take, a slam of the brakes, and YES, it was a Burrowing Owl! Mere minutes from our house! I watched for a while before returning with my camera, and quickly realized it was a family of 2 adults and at least 4 youngsters. There were nesting in an old badger hole in an alfalfa field, a far cry from the prairie dog towns I was used to seeing them in. For nearly 2 months I watched the little family grow up and eventually disappear for the winter. Never again have I seen Burrowing Owls anywhere close to this part of South Dakota, but I’ll always remember this special little family. Horned Puffin – Fox Island, Alaska – August 2010 — Who doesn’t love Puffins? 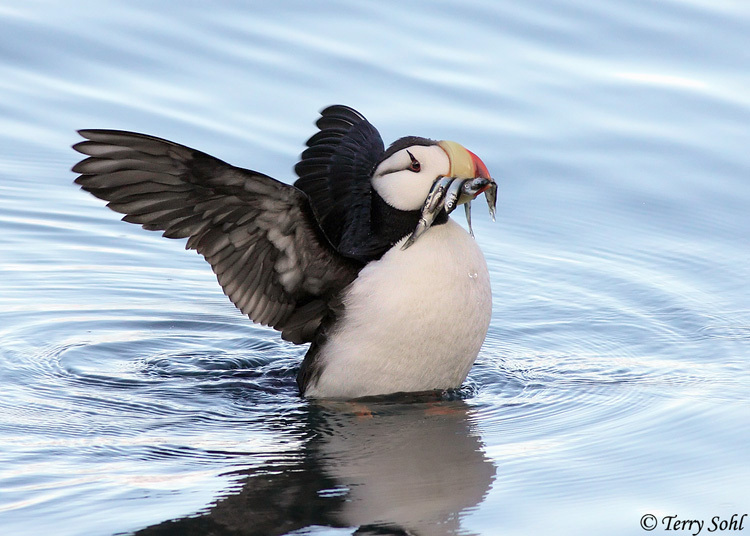 I’ve been fortunate to see all three species in the wild, seeing Atlantic Puffins on a short whale-watching cruise off of the coast of Maine, seeing Tufted Puffins many times at Cannon Beach in Oregon, and seeing Horned Puffins in Alaska. This was during one of our most memorable family vacations, where we visited several locations in Alaska. Our favorite part of the trip was staying overnight on “Fox Island” just outside of Seward Alaska, and taking an all-day wildlife cruise the next day. When we awoke from our cabin on Fox Island that morning, there were several Horned Puffins feeding just off of the rocky beach. It was simply a matter of sitting and waiting for one to surface. I was fortunate enough to catch this adult with both a bill full of fish, but also a nice wing stretch. A definite favorite photo of mine. Costa’s Hummingbird – Madera Canyon, Arizona – November 2015 — I do manage to fit some birding in when we go on family vacations, but because I don’t want to take time away from our family, it’s typically early morning hours, before my wife and son get up. That changes, however, when I go on work trips. If I have a work trip in an area with a good birding location nearby, I will often use my own money and stay and extra day to bird. In November of 2015, I had work meetings in Tucson…one of our favorite locations on earth. Did I mention earlier that Cannon Beach was “heaven on earth” for a birder? Take that, double it, and add 3,456, and that describes how great birding is in the Tucson area. 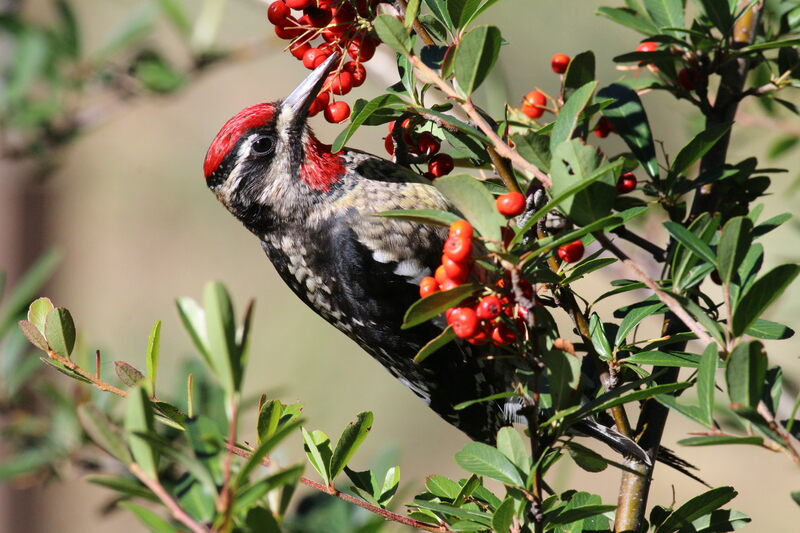 There are many famous birding locations in the area, including Madera Canyon south of Tucson. This trip was incredibly memorable because I saw several species for the first time, including a “Holy Grail” bird for birders in the U.S., and Elegant Trogon. 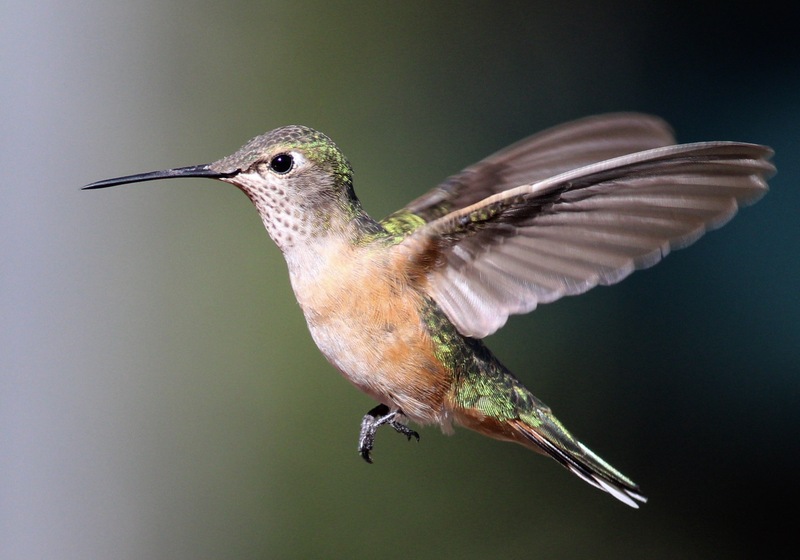 Another attraction for the area in general is the wonderful variety of hummingbirds that are often around, some of which are rarely found elsewhere in the United States. 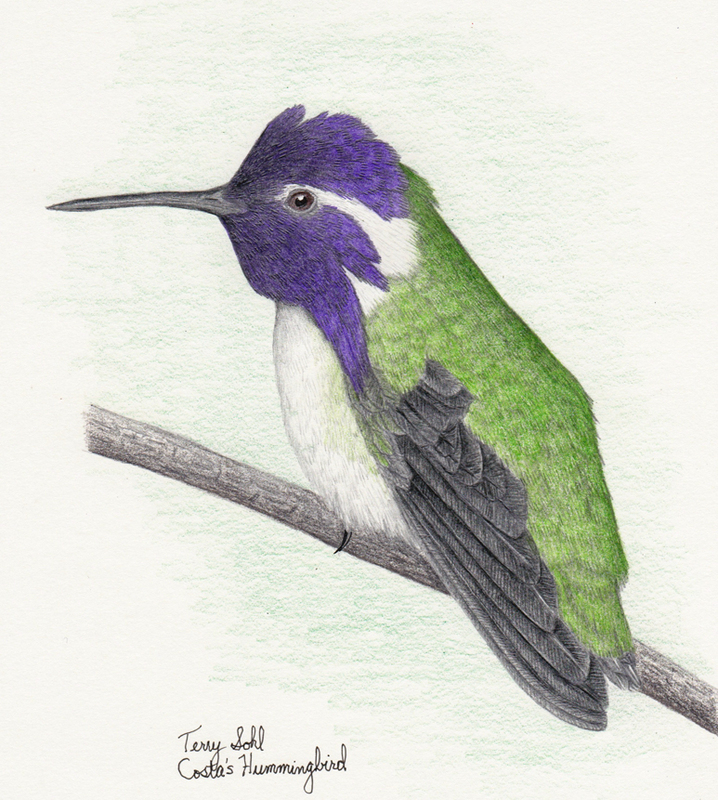 This is a male Costa’s Hummingbird, not one of the mega-rarities, but one of my favorite hummingbird species. It’s hard to capture the colors of male hummingbird’s gorget, as the light has to be JUST right, but on this occasion the lighting helped to show off that brilliant purple gorget of a male Costa’s. 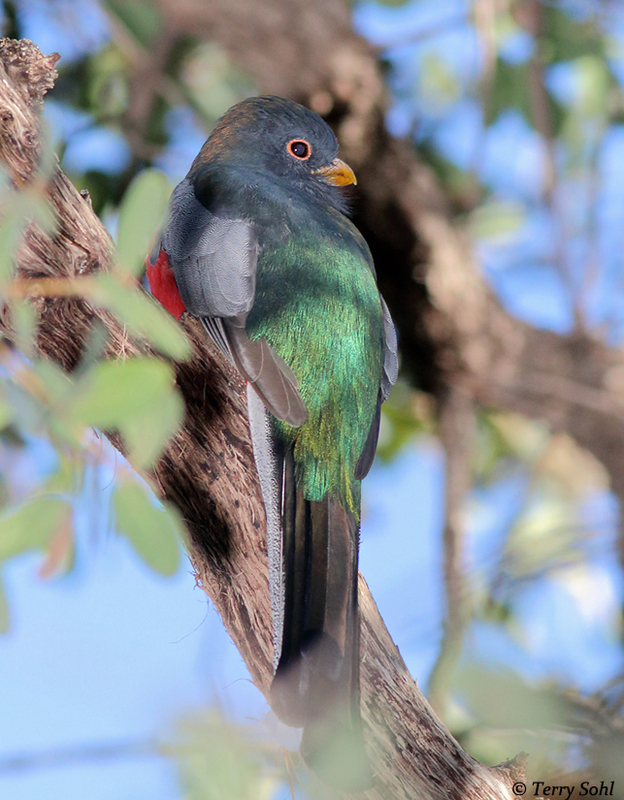 Elegant Trogon – Madera Canyon near Tucson, Arizona – November 2015 — After mentioning it with the previous photo, how can I not show this? Elegant Trogons are indeed a “Holy Grail” kind of a bird, as they are uncommon to begin with, and have a range that just barely touches the U.S. On occasion they are found in some of the forested canyons of southern Arizona, near the border. I’ve been to two of those, “Ramsey Canyon”, where I’ve visited twice, and “Madera Canyon”, where I’ve been 3 times. In my November 2015 visit to Madera Canyon, I knew the timing wasn’t great. Summer is much better for hummingbirds, as well as many other rarities that breed in these canyons. Elegant Trogon have bred in these canyons, but most of the time, they move southward for the winter. On occasion, however, one overwinters. I wasn’t thinking “Trogon” at ALL as I visited the area. I had heard of another rarity, a Rufous-capped Warbler that had been seen in nearby Florida Canyon, so I thought I’d try making the hike to where that bird was seen. I parked the car, headed up the trail, and struck out on the warbler. However, when I was nearly back to my car and about to leave, I saw the movement of a large bird out of the corner of my eye. Elegant Trogon! It had just flown down the canyon and landed in a tree by the creek! I’ve been birding 15 years, and don’t really freak out when I see a “good” bird, but I must say, as I raised the camera to try to get a shot, I was shaking a bit, just PRAYING it didn’t move or fly away before I could watch it and get a photo. Fortunately, it stayed in its perch for a few minutes before flying away. This definitely isn’t one of my greatest photos from a photographer’s standpoint, but I’ll always consider it one of my greatest experiences from a birding standpoint. 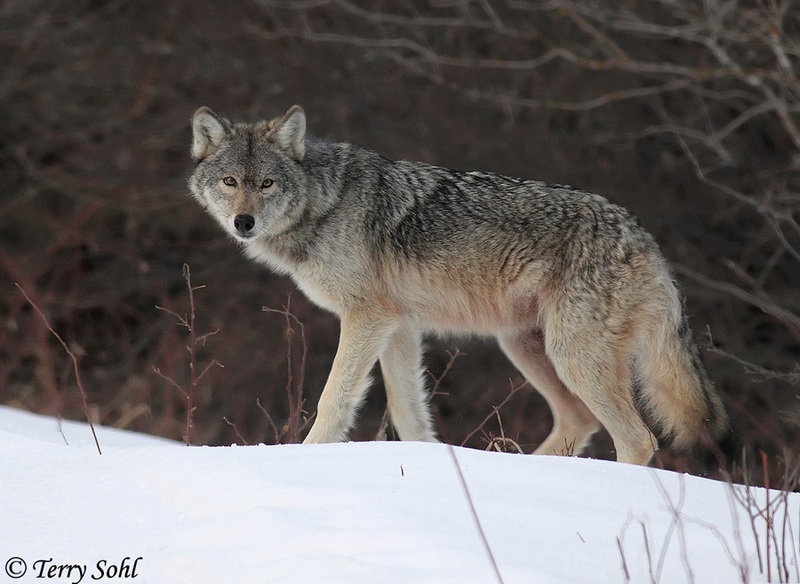 Gray Wolf – Sax-Zim Bog, Minnesota – March 2013 — I admit I often turn a blind eye to any photo opportunity that doesn’t involve a bird. Sometimes an opportunity arises that you can’t pass up, however. Another favorite American birding location for me is Sax-Zim Bog in Minnesota. I was there for the incredible northern owl irruption of 2004, when in one day, I saw over 30 Great Gray Owls, and over 30 Northern Hawk Owls. It’s never been quite as magical since that incredible winter, but it’s still a wonderful place to try to find a northern owl or other boreal species that are hard to find in the lower 48 states. In early March of 2013 I thought I’d try one last late-winter visit, hoping to spot Boreal Owls that had been seen in the area. I ended up striking out on owls, but the trip ended up being magical due to what happened in the first 10 minutes when I arrived at the bog. I had gotten up ridiculously early and left Brandon at about 2:00 in the morning, hoping to arrive in the Sax-Zim area just a little after dawn. As I reached the bog and started up a small road, I saw movement in the trees to my left. As I stopped to see what it was, this beautiful creature stepped out of the woods, a lone Gray Wolf. He stopped for a second and stared right at me before deciding I wasn’t all that interesting. He slowly trotted across the road and back into the forest. It remains the only wild wolf I’ve ever seen (even with all our visits to Yellowstone! ), and I’m very grateful he paused long enough for me to get this photo. 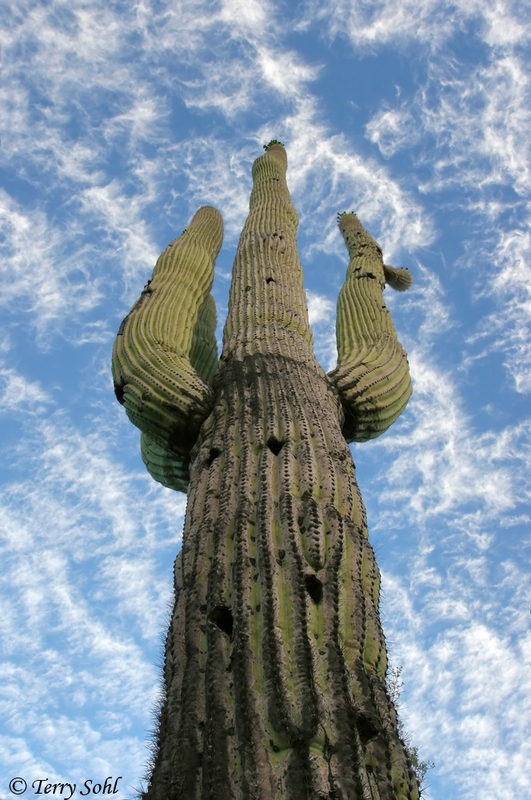 Saguaro Sky – Near Tucson, Arizona — Yeah, another Tucson area shot. There’s a wonderful B&B we’ve stayed at multiple times on the edge of Tucson, right next to Saguaro National Park. The B&B owners have their own 40 acres of beautiful Sonoran Desert habitat, and I just love getting up at dawn to walk through it and take photos. As always, birds are a focus, but other critters I’ve found there include rattlesnakes, coyotes, javelina, and even a bobcat one morning. On this morning, just after dawn, it was the sky the caught my attention The sun was just coming over the mountains, and the blue sky was dotted with beautifully patterned, high, wispy clouds. I decided to try something new (for me), trying to capture the majesty of the tallest saguaro cactus I could find, with that gorgeous sky as a backdrop. I also call this photo “Paying the Price”. I laid flat on my back at the base of the saguaro to get this photo, shooting up into the sky. Did you know that in a Sonoran desert habitat, the ground is sprinkled with all KINDS of cactus needles? Neither did I! I got the shot I wanted, and was thrilled with the result, but also spent half an hour back in the B&B having my wife pick cactus thorns out of my back and legs. Dark-phase Gyrfalcon – Fort Pierre National Grasslands, South Dakota – January 2010 — This is both one of my favorite photos, and a photo that breaks my heart. In all the dead of winter trips I take to the central part of the state, THE attraction, the ONE SPECIES I’m really hoping to see, is a Gyrfalcon. They’re the largest falcon in the world, and are a bird that’s damned tough to ever see in the United States, outside of Alaska. Every winter, a few may straggle down from the Arctic and cross into the United States, but they’re real rarities and another “Holy Grail” bird for U.S. birders. Central South Dakota is actually one of the best places to see them in the lower 48, and I’ve been lucky enough to find them on several occasions. On this day, in the distance I saw a dark bird on a snag. Given the coloration, I wasn’t thinking “Gyrfalcon” at all. It was too dark. As I got closer, I saw it was indeed a Gyrfalcon, a young, dark-phase Gyrfalcon. 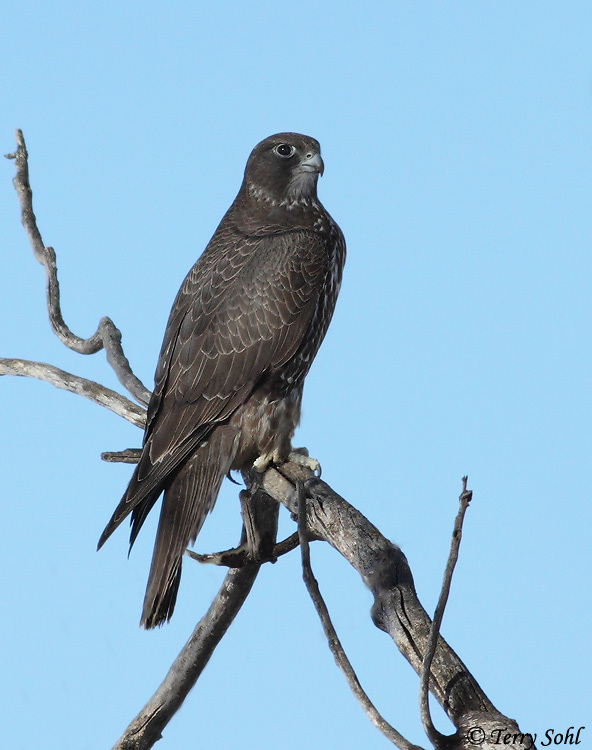 This is the only dark Gyrfalcon I’ve seen, and it was a thrill to get some nice photos of him. However, as I approached, I also noticed a bird seemingly struggling in the middle of the gravel road. As I got closer, I saw it was a pigeon, tangled inside a net. That pigeon DEFINITELY had the attention of the Gyrfalcon, but he wasn’t about to make a move while I was there. As I wondered what to do, a SUV came roaring down the hill, and as they approached, a man and woman frantically waved their arms at me, motioning me to “move away” from the pigeon. Not knowing what the hell was going on, I pulled up to them, rolled down the window, and asked what was going on. They were falconers. The pigeon and net was theirs. They were trying to capture the young Gyrfalcon to use for falconry. Unfortunately this actually IS legal in the U.S., even for a mega-rarity such as a Gyrfalcon. They had the proper permits. I admit I wasn’t the friendliest to this couple. There are SO few Gyrfalcons that ever make it into the lower 48 states, it just didn’t seem right that they could actually capture one and keep it for their own personal entertainment. Unfortunately, that young Gyr stayed in his perch the entire time I argued with the couple. After a while, after checking with South Dakota Game Fish & Parks friend to see if this was indeed legal, I drove off. I always wondered if that couple caught the Gyrfalcon. That even DEFINITELY changed my behavior though as a birder. After finding out that falconers often scour the birding hotlines for news of a Gyrfalcon, I now NEVER report a Gyrfalcon sighting. After coming across this bird and the falconers trying to catch it, never again will I do anything that could potentially help a falconer remove one of these magnificent birds from the wild. 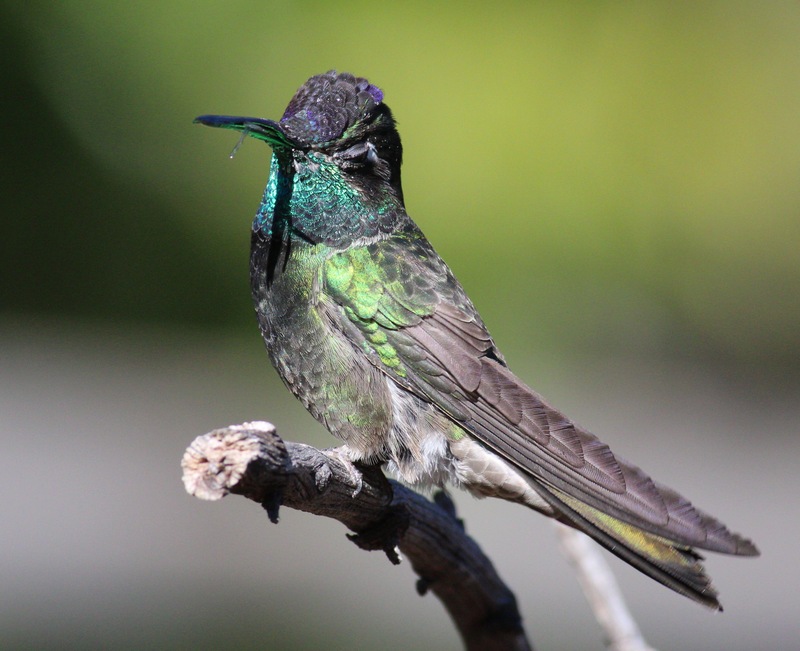 A male Magnificent Hummingbird soaking up some rays at Santa Rita Lodge. May 7th. It always within a day or two of May 7th when the first Ruby-throated Hummingbird shows up in our yard. While there are no confirmed breeding records in far southeastern South Dakota, there’s little doubt they nest there. I have birds in my yard all summer, and by July sometime I start to see immature birds. After a great (but short!) summer flitting about our yard, they’re gone by the end of September. That’s less than 5 months, with the “hummingbird off season” consisting of 7+ months of cold weather and absolutely zero hummingbirds. It’s the “hummingbird off-season” where I am this week, in Tucson. 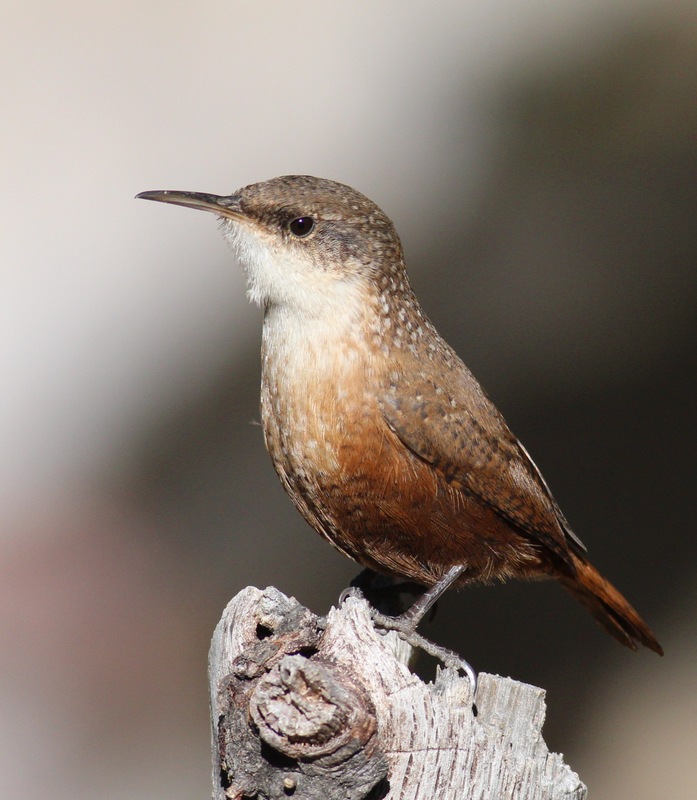 After peaking in August here, where up to 15 hummingbird species may be sighted, numbers and variety start to dwindle. By this time in November the slow season is definitely underway. There’s just a WEE bit of a difference in the Tucson off season compared to South Dakota. Here in the Tucson area, you can still find plenty of hummingbirds, but “only” 4-5 kinds (typically). 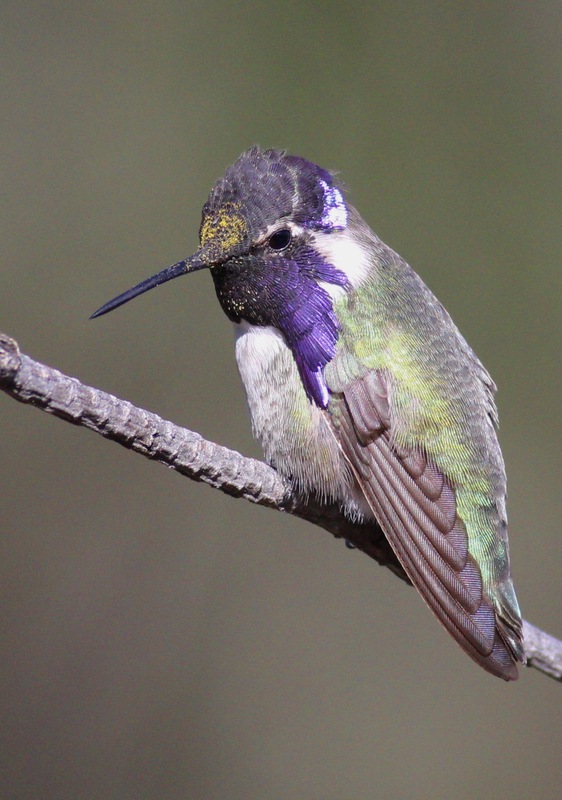 A male Costa’s Hummingbird, not commonly found at Madera Canyon in the winter. There are some extremely famous hummingbird locales that attract birders from across the world. 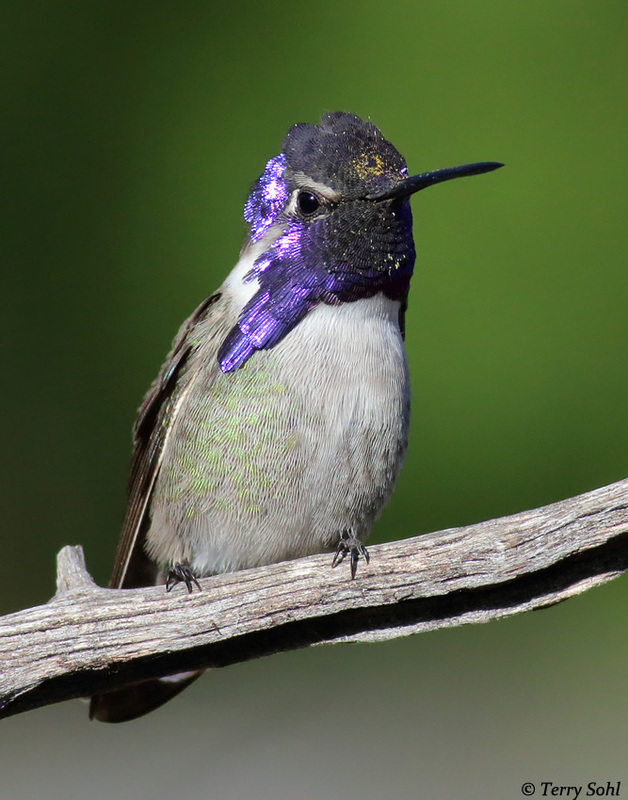 Madera Canyon south of Tucson is world famous for many birds, but it’s the hummingbird feeders at Santa Rita Lodge that are the big attraction for many. In the non-work part of my trip I twice visited Madera and Santa Rita Lodge, and I’d be hard pressed to call it the “off-season”. No, there were no Plain-capped Starthroats, Violet-crowned Hummingbirds, or other U.S. mega-rarities that make southern Arizona famous. For the week I “only” saw and photographed five different species, with all five being seen at Santa Rita Lodge (and some species also found elsewhere). From a photographers standpoint it’s really nice taking photos at Santa Rita Lodge. Until 1:00 or so you have the sun at your back, and most of the feeders are out in the sunlight, making it easy to get beautiful photos of hummingbirds with their gorgets “lit-up”. The ever-present Mexican Jays, Bridled Titmouse, and Wild Turkeys are there to entertain, and you never know what might show up to feed on the suet, fruit, and seeds that are also available. Hepatic Tanagers have an extremely limited U.S. range, but they are pretty reliable in Madera Canyon. Despite it also being the “off-season” for them, I did find a pair at Santa Rita Lodge and was able to add the species to my life list. 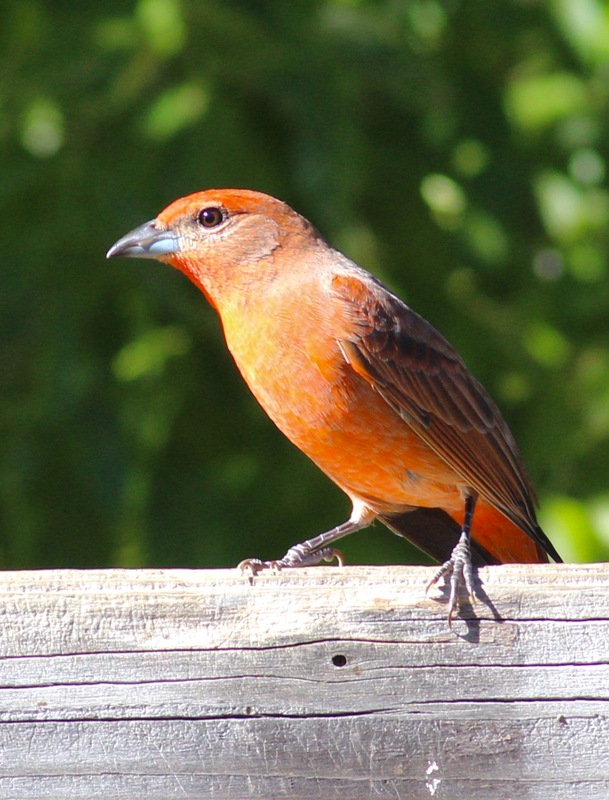 Hepatic Tanager, a southern Arizona specialty. Not a bad “off-season” visit! And this doesn’t even touch on the Elegant Trogon or other birds you can find in the Canyon. I enjoyed birding this week all around the Tucson area, but in terms of “birdy-ness”, nothing beats a trip to Madera Canyon and Santa Rita Lodge.